Staffordshire has been chosen as one of only five areas of the country to pilot the new NHS app for patients that will be at the forefront of the digital healthcare revolution. The app, which it is hoped to rollout nationally next year, will undergo “beta testing” in Staffordshire until the end of the year. Patients with either iOS or Android devices will be able to use it to book and manage appointments, order repeat prescriptions, check symptoms and get advice; and sign up to become an organ donor. The announcement was made by Health Secretary Matt Hancock at the Health and Care Innovation Expo. Together We’re Better Director Simon Whitehouse has warmly received the announcement of £8.8m of extra Government money for University Hospitals of North Midlands NHS Trust (UHNM) to fund two new modular wards at Royal Stoke University Hospital. “This significant investment to support the local health and care system to prepare for winter is very welcome,” said Simon. “This new funding will greatly support how the health and care system in Staffordshire and Stoke-on-Trent prepares for winter and I’m delighted the application was backed by the Department of Health and Social Care.” The announcement is part of a £145m funding package for NHS trusts nationally. Patients across Staffordshire and Stoke-on-Trent are now able to access primary care services for longer under a new NHS initiative. Additional appointments are being made available to patients during weekday evenings and at weekends. Together We're Better Director Simon Whitehouse said: "This is welcome news and it is fantastic that this is being delivered by local GPs. We need to support our GPs as they are the cornerstone of our care model. We can’t expect them to simply do more with the same staff; it's not sustainable or good for staff or patients." help people remain independent and at home for as long as possible. Sir Neil and Simon visited early implementer sites in Meir in Stoke-on-Trent and Lichfield. Two other early implementer sites are operational in Leek/Biddulph and Stafford. Dr Faraz Mughal, GP and NIHR in practice fellow. 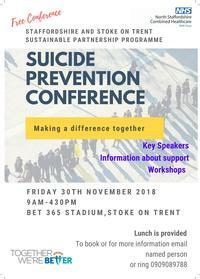 The free conference will also include a series of workshops, while lunch and refreshments will be provided. Places are limited, so please click on the link below to make your booking. The second Symphony for Hidden Voices Inclusion Conference was held on 7 September. The conference was hosted by North Staffordshire Combined Healthcare NHS Trust and supports the work of Together We're Better's Organisational Development and Leadership programme. It saw the launch of TWB's Stepping Up Black, Asian and Minority Ethnic (BAME) Leadership Programme, which supports existing and aspiring BAME leaders to further develop their skills. Keynote speaker for the event was award-winning nurse Professor Dame Elizabeth Anionwu, while other speakers spoke about how their lives have been shaped in different ways by their experiences of inclusion and exclusion. Congratulations to Midlands Partnership NHS Foundation Trust, which has been profiled in a national report for its focus on continuous quality improvement. The trust features in the ‘Quality improvement in hospital trusts – sharing learning from trusts on a journey of QI report’, published by the Care Quality Commission (CQC). The report includes a number of MPFT case studies focus on celebrating, learning and success which highlight how the trust celebrates success by proactively engaging with staff using numerous methods. Three new non-executive directors have been appointed to the Board at University Hospitals of North Midlands NHS Trust. Prof Gary Crowe, Peter Akid and Leigh Griffin were appointed as non-execs on 1 September 2018, and will be joined by Ian Smith as an associate non-executive director in early 2019. People needing support for drug or alcohol misuse are set to benefit from a new service in Stoke-on-Trent. The city council has awarded a new contract to North Staffordshire Combined Healthcare NHS Trust – in association with Addaction and BAC O’Connor – for delivery of drug and alcohol services over the next five years (with the option to extend for a further two). This will give improved long-term support for people in need and will ensure stability, be more consistent and effective, and deliver more value for money. Together We’re Better is the transformation partnership for health and social care across Staffordshire and Stoke-on-Trent.